Salt Creek is hard to hit when the flows are right but it usually runs at the same time as nearby Salmon Creek (see the Salmon Creek Gorge report for flows). 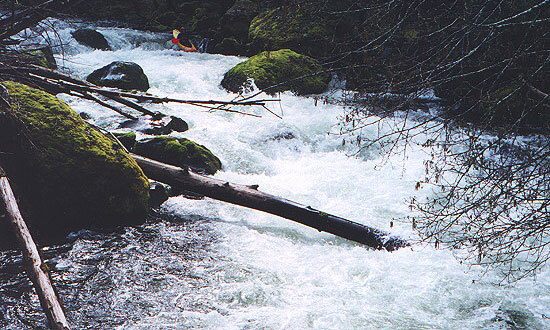 In April 2000 we ran the upper two miles of this creek and we encountered a mixed bag of fairly easy whitewater and some wood. The first major rapid is Luggage Inspector. This drop starts with an easy boulder garden and then drops out of sight into a twisty drop that has a bit of wood on the right. Mike enters the second drop on Luggage Inspector. This was the woodiest drop on the run when we did it; all of the rest were much cleaner. Below this drop are more easily boat scoutable drops and then one last pushy boulder garden above the first road bridge. This last drop doesn't have many eddies and is difficult to safely boat scout. We took out at the bridge because the creek becomes class II-III with wood below that. Rather than deal with this we drove ten minutes across the valley and ran Salmon Creek Gorge. One more thing about Salt Creek. There is one spot you should especially be aware of below where we took out- just above the second road bridge the forest service cut down an old growth tree, completely blocking the creek. They did this so firefighters could safely cross the creek, so watch out for this one!